Hua Hin is unlike any other beach resort in Thailand. If you’re looking for bright lights and the frantic all-night action of cabarets and discos, you may be disappointed here. However, if you enjoy walks through the quiet winding streets of a friendly coastal village, sampling delicious seafood in restaurants overlooking the brightly lit fishing boats on the Gulf of Thailand or a round of golf on one of the several international standard links, Hua Hin could very well be what you’re looking for; Hua Hin has a special character all its own. Hua Hin became popular as a rainy season retreat in the 1920’s with the construction of the railway line from Bangkok. The beautiful, colonial style Railway Hotel was built near Hua Hin’s famous rocks in 1923 by the State Railway Authority, which also built Thailand’s first public golf course in Hua Hin in 1924. In 1926, King Rama VII built the Klai Kangwon (Far From Worries) Palace on the beach a few km north of the Railway Hotel and this palace is still often used by the Royal Family. This set the stage for Hua Hin’s popularity and unique ambiance which remains to this day. In addition, there is a new page featuring photos from the Dan Sing Khon Border Market here. 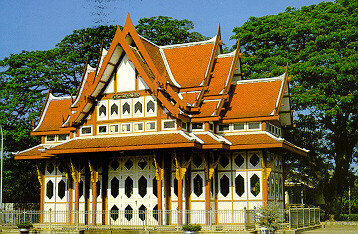 Hua Hin is 200 km south of Bangkok on the west coast of the Gulf of Thailand. Travel by automobile takes less than three hours and by air is less than an hour. The resort may also be reached by rail or coach. This page also has links to several maps, one an interactive Google Map with over 200 placemarks in Hua Hin, Cha Am, and Pranburi that you can explore and another, a map made using a Garmin GPS that you might want to print and carry with you. There are also maps of Dolphin Bay, Samut Songkhram and Ratchburi, and Korat and Khon Kaen. 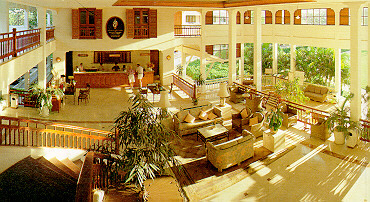 There are close to 300 hotels and guesthouses in and around Hua Hin with over 11,000 rooms with more opening all the time. There are well over 1,000,000 visitors to Hua Hin each year, about 70% domestic. While the smaller guesthouses have spartan rooms for a few dollars a night, high-rollers can be pampered to their heart’s delight for a bit more at one of the several 5-star luxury resorts and spas, including the Dusit, Chiva Som, Marriott, Sheraton, Hilton, and Hyatt. 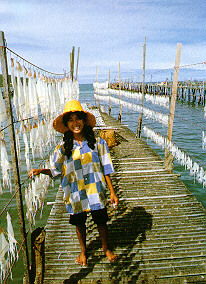 The active fishing port guarantees fresh seafood and Hua Hin has it all, including dishes not found in other parts of Thailand. There are many styles of restaurant, from a row of large, brightly lit establishments with extensive menus along the beach near the pier, to small stalls at the lively night markets specializing in only a tasty dish or two. Lovers of fast food need not worry, Hua Hin now boasts (or regrets?) the openings of KFCs, Starbucks, McDonalds, Burger King, both the Pizzas, a couple of Steaks and ice cream shops with various logos. Fans of suki and Japanese food should also be pleased. 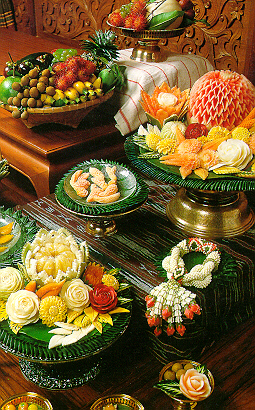 Also be sure to sample the wide variety of fruits and kanoms (Thai sweets) available in restaurants, shops and stalls along the road. Though there are several luxury spas in Hua Hin, I’m sure no one loses weight during their stay here. 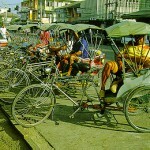 Hua Hin is small enough that one can wander for hours without the need of motor transportation. 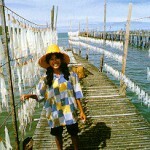 Most hotels are no more than few minutes walk to the beach, the market or a friendly restaurant. Hua Hin has much to offer the entire family. There are many shops selling local handicrafts, silver, silk, tailors to fit you for that custom suit, and dozens of photo opportunities. There are also large shopping malls, outlet stores and large discount stores for those looking for shop after shop in the same building. Many links to maps of the popular locations are also included on this page. 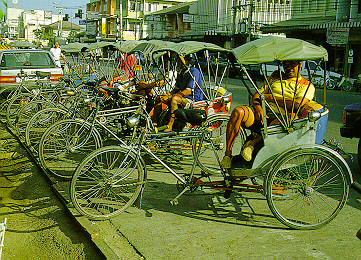 Bicycles, motorcycles and small jeeps can be rented from shops around the Hua Hin Bazaar, near the Sofitel entrance, and just about every spot that used to be a parking place for visitors. Unless you have extensive experience dodging kids, bicycles, scooters and the occasional cow, be very careful when driving yourself. 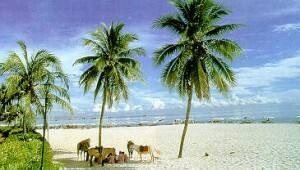 The white sand goes for miles from the Sofitel at the end of Damnoenkasem Rd. At the main beach there are umbrellas for lounging and vendors will satisfy your needs for drinks and snacks, and even pony rides, jet skis and a Thai traditional massage. Hua Hin is now also well known for kiting or kite boarding with several shops towards the southern end of the beach providing instruction and equipment rental. 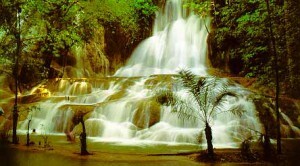 There are also pleasant beaches in nearby Cha Am and Pranburi. Maps to these and other beaches are included. 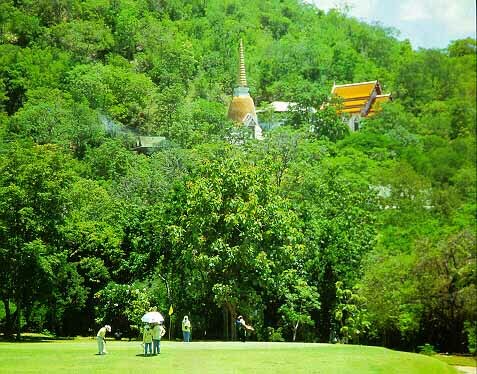 The first golf course in Thailand was built-in Hua Hin in 1924 and there are now 10 courses within 40km of the town including the new Banyan, Black Mountain, and Sea Pines courses. These courses are world-class and green fees and caddy charges are very reasonable. Electric carts are available at most though a walk in the beautiful climate of Hua Hin is a pleasure in itself. Though the beaches and swimming pools are always beckoning, the Hua Hin area also has shopping, temples, waterfalls, caves, quaint neighborhoods and historical sites that will create memories for all members of the family. A leisurely drive though the countryside, where one can see rice paddies and pineapple plantations, children playing in the canals, and the beautiful scenery of Prachuapkirikhan and Petchburi provinces is also a must. Within a few km there are also floating markets, amusement parks, sheep farms, water parks, and elephant camps which are great for the kids and offer many opportunities for photographs. Kaeng Krachan National Park extends along the Burmese border from Petchburi Province north of Hua Hin with beautiful waterfall to be seen during the rainy season. 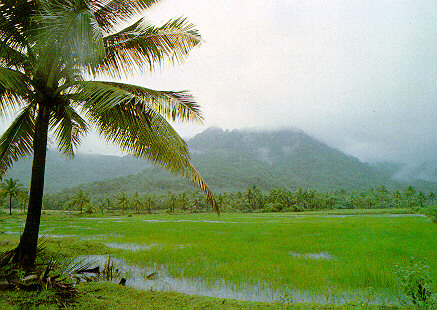 You may also be able to organize a trekking tour to visit some of the hill tribes in the area. Opportunities for ecotourism abound here. To the south, Thailand’s first marine national park, Khao Sam Roi Yot, is only about 35km away. A bit further away, in Kanchanaburi Province, there are five more national parks, Erawan, Sai Yoke, Sri Nakarin, Khao Laem, and Chalerm Rattanakosin. Not everyone comes to Hua Hin as a tourist. Many are looking for a place for a summer home or retirement. Here we discuss education, housing, Internet, banking, medical issues, TEFL teaching and other topics important to the increasing number of folks choosing to reside in Hua Hin on a longer basis. A few thunderstorms possible. Low 25C. Scattered thunderstorms in the morning, then cloudy skies late. High 31C. Winds WSW at 15 to 25 km/h. Chance of rain 40%. Showers early then scattered thunderstorms developing later in the day. High 31C. Winds W at 15 to 25 km/h. Chance of rain 40%.